Originally published in 1992. At its foundation FAO was conceived as an organization that would bring together health and agriculture. It would manage the world’s food output to greater advantage and improve the well-being of its people. Almost a half-century on, FAO faced mounting criticism from its major funding nations, professionals within the field, and developing countries. The efficacy of its constitution, bureaucracy and aid, and even its fidelity to original ideals are questioned. This book presents an informed, if irreverent, insider’s view. 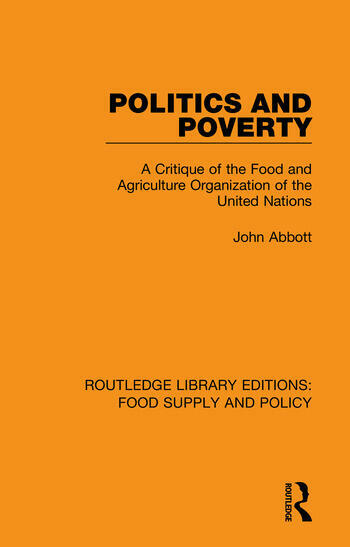 The first part of the book sets out the structure and activities of FAO. It gives a human dimension, describing the personalities that have influenced decisions and performance, the motivations of its staff, its location in Rome. The second part appraises FAO’S success in achieving its ultimate objective the alleviation of poverty. Throughout, the concern is both for a more visionary organization to help develop a sustainable income base for the rural poor in the developing world. Preface 1. Introduction: Storm Clouds Mar the Ideal Part 1: The Organization and its Staff 2. The Organization 3. Directors General 4. Professionals 5. General Service 6. The FAO Way 7. FAO in Rome Part 2: Poverty Alleviation: FAO’s Performance in the Area of Marketing 8. Marketing and the Rural Poor 9. FAO Marketing Assistance 10. The Marketing Group in FAO 11. Can FAO Be Young Again?